Although it may look like a run-of-the-mill toaster oven, don’t let its modest appearance deceive you. This little appliance will quickly turn a poor soul who can’t fry an egg into a master chef—or something close to one. 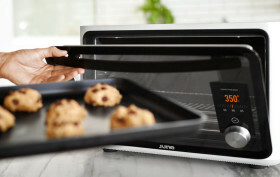 Invented by Ammunition Group, a team credited with bringing the iPhone, the FitBit, the GoPro, and Lyft to market, the June Intelligent Oven is a revolutionary kitchen appliance that harnesses the power of everything we digital age junkies love: computers, a HD camera, and a Google-like image search system that can determine what we’re cooking and how it should be cooked.